The formerly free Friday Cheers, sponsored by Venture Richmond and presented at Brown’s Island, now charges $5-$10 a ticket. 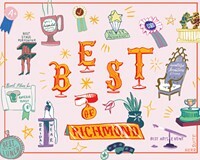 Despite Richmond’s penchant for free things, locals still love it. For 27 years, the weekly concert series has offered a wide variety of music — this year, Sharon Jones and the Drive-By Truckers are among those scheduled — and given beer-sipping Richmonders a tuneful place by the river to wind down their weeks.